Warning: This is possibly (probably?) the most shallow post in the world. 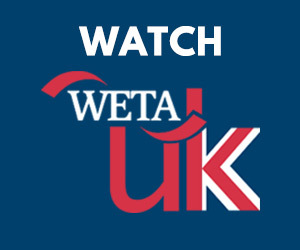 Please feel free to just skip right on by this one, unless you’re one of the multitude of newly converted members of the apparently immense Benedict Cumberbatch online army. Then you’ll enjoy it. So you know, there’s that. If you haven’t been online in the past week, you may have missed the fact that the internet has basically lost its mind over the Sherlock star, whose turn as the villain in Star Trek Into Darkness has won raves from both critics and fans and made him an even bigger online rockstar than before. (He sort of deserves it, though, so it’s okay.) Besides that, filming on Series 3 of Sherlock was also going on this week, and since it was the last bit of shooting before the team takes a two-month break there’s been a fair bit of end-of-term style silliness from that side, as well. Basically, it’s been a good week to be a Cumberbatch fan, is what I’m saying. Click through for what are clearly the two best bits. In case you haven’t been paying attention, Star Trek has been the subject of some controversy for including a scene of British actress Alice Eve in her underwear for seriously no apparent reason. (For those who haven’t seen the film, the basic context is that her character is suddenly motivated to change her clothes, in a place where no person with sense would suddenly perform this action. It’s ridiculous.) Anyway, writer Damon Lindelof has already apologized to fans who found that scene offensive or exploitative (which it is), but director J.J. Abrams’ response was to get in some equal opportunity exploitation by releasing a deleted scene from the film on Conan O’Brien’s late night talk show. This clip features Cumberbatch’s villainous John Harrison in the shower, shirtless, and apparently also quite cross about it, in a sort of wet cat kind of way. This of course in no way excuses the other situation, nor am I entirely comfortable with using one visually objectifying, sexist scene as a defense against the other – particularly when one was included in the film and one wasn’t- but whatever. You be the judge. Take a moment to breathe into a bag if you need to. It’s okay. Moving on to more, um, clothed Cumberbatch-related entertainment, the silliest behind-the-scenes photo ever also hit the web this week. To celebrate the wrap of filming on The Sign of Three (and sadly his own involvement with the show this season) cinematographer Steve Lawes tweeted the following epic photo featuring himself, Cumberbatch, Freeman and production designer Arwel Wyn Jones. If there’s one image I’m going to take away from the whole experience of obsessively tracking the Series 3 filming over the internet, it’s this one. Many people seem to be convinced that Cumberbatch’s pose is a reference to the Vulcan “Live long and prosper” salute as homage to his now-infamous appearance in Star Trek, but to me it looks like he’s actually making the Nerdfighter sign. (Motto: Don’t forget to be awesome.) 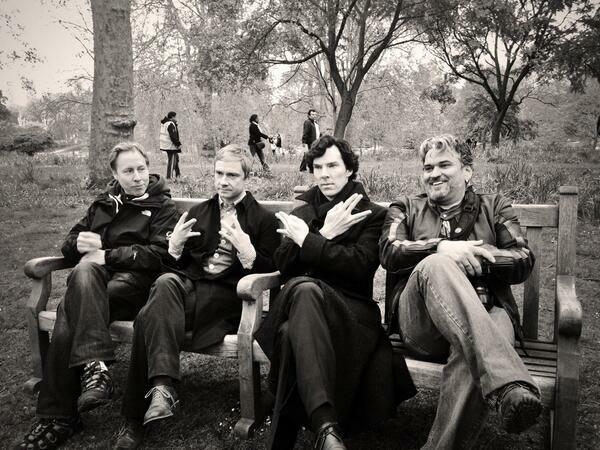 As for Martin Freeman doing what appears to be the gang symbol for “West Side”, well, I don’t even know. Maybe he means Series 3. Maybe he’s just a goofball. Does it really matter anyway? This is the most awesome Sherlock behind-the-scenes photo in history, so let’s just enjoy it. And if we’ve got to get through the next two months with no filming reports to sustain us, at least that’s a pretty good image to carry on with.